"Going to Limitless Learning for SAT Prep definitely empowered me as a student and put me ten steps ahead of everyone at school. The SAT tutoring I received enabled me to compete with other students not just on a local scale, but on a national one. My scores dramatically improved over a hundred points and gave me a real opportunity for admission to a prestigious university. Two years after making the most beneficial investment into my education through Limitless, I am now attending Columbia University to study chemical engineering- one of the most prestigious universities in the nation. Alongside helping my math and reading skills, the tutoring I received at Limitless Learning helped me improve my overall intellectual approach and fostered outside of the box thinking. The preparation I received will undoubtedly empower me for many years to come, both in the classroom and in the workforce." "Our daughter, Maria del Carmen Castillo, a student at the United High School Engineering Magnet School, showed a lot of potential in her tenth grade PSAT scores. In order to improve her scores and the opportunities that come with high scores, we enrolled her at Limitless Learning in June 2015 for the SAT/ACT preparation course. The course complemented her classroom instruction and helped her improve her PSAT, SAT, and ACT scores significantly. The individual assistance she has received from L2 has also prepared her and given her confidence for the upcoming Advanced Placement exams in calculus and statistics. We still do not know which opportunities will be available to her when she graduates in 2017. We are certain, however, that she will have wonderful choices to select from. L2 and their staff have built an incredible resource for the students in our community. The environment they have created for the children they serve promotes discipline, hard work, and the "limitless" opportunities that "learning" brings." "Limitless Learning is an excellent tutoring center with tutors that understand the needs of the students and that try to better educate them. They're equipped with all the necessary materials needed to ensure the success of the students. I have been getting Test Prep with Limitless Learning and my scores have increased dramatically through the guidance of my tutors. Their services with college application help and everything related to further education have been instrumental to my success. I most definately recommend Limitless Learning to any student that may be struggling or would just like some help. The friendly tutors will point you in the right direction, every week." "All of the tutors I was fortunate enough to work with at Limitless allowed me to unlock my full potential. Through challenging, yet helpful tutoring sessions, I was able to understand difficult concepts from subjects that were not my strong suit. I can genuinely say Limitless Learning has helped prepare me for my future years in college and beyond! 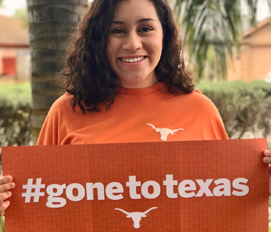 I will be attending the University of Texas at Austin where I will major in Biology, and I am proud to be representing such a great institution like Limitless Learning." "Limitless Learning is like having a door with two key slots. One of the key holes is completed with your tutor and the other key hole is completed when you apply yourself on your own; however, to acquire the second key you need to have faith in yourself. Limitless Learning has helped me acquire that second key and now I'm opening so many doors I previously couldn't." "Tutors at Limitless Learning were insightful and adept within their respective subjects. The tutors and staff were always approachable and supportive with any problems I had. The environment at L2 provided me with opportunities to ask questions that I felt apprehensive about. No matter the question, the tutors and staff were there to answer with perspicuity in which I could fully comprehend without difficulty. Ever since I could remember English and writing were always difficult for me to grasp. However, the tutors at Limitless Learning not only taught me to understand the subject, but to also be more fluent and comfortable when writing my essays. Truly, my experience at Limitless Learning was an unforgettable one. I believe that the knowledge Limitless provided me with is sure to make me competitive not only when I apply to Universities in Texas, but anywhere I may decide to attend in the near future." "Before I enrolled at Limitless Learning, I was the type of student that was afraid to ask my teacher for help on a lesson I didn't understand. Ever since I came to limitless learning however, I have gained the courage to ask my tutor and teacher for problems I needed help with. It has allowed me to be more confident when working on my own assignments at school and at home. "